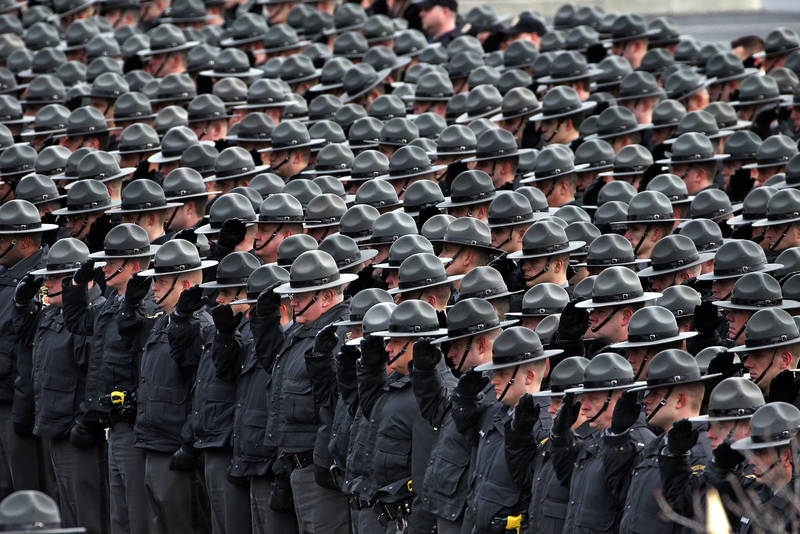 ALTOONA, Pa. (AP) — Hundreds paid tribute Thursday to a young Pennsylvania state trooper killed in the line of duty after only about a year on the force. At a funeral at the Blair County Convention Center, Trooper Landon Weaver, 23, was remembered as a hero and Gov. Tom Wolf expressed gratitude for Weaver’s service. Outside, several people held a large American flag on a hill overlooking the center. Afterward, a motorcade with hundreds of police vehicles escorted a silver hearse carrying Weaver’s casket to a cemetery 20 miles away for the burial. Weaver was shot Dec. 30 at a home in Hesston while investigating a report of a domestic protection violation. Police said Jason Robison killed the trooper and police later tracked down Robison and fatally shot him when he threatened officers and failed to follow their orders. Wolf said Weaver’s death “leaves a hole in the lives of so many people” — including his wife, Macy, his parents, and his friends. Weaver graduated from Central High in Martinsburg in 2012 and attended Indiana University of Pennsylvania before starting at the state police academy about a year ago. He and his wife married in June, when Weaver also joined a patrol unit in Huntingdon. Macy Weaver eulogized her husband, and top state police officials, clergy and others also spoke at the funeral. “Landon’s comrades in the Pennsylvania State Police lost a brother. And all of us lost a hero whose purpose was to serve us,” Wolf said. Weaver was investigating whether Robison had violated the order issued in April, after the mother of his 6-year-old son told authorities Robison attacked her and said he would kill her. A police affidavit said Robison texted his son’s mother after the shooting to say he “killed the cop.” Robison’s mother, Sherry Robison, told investigators she saw her son pull a small black gun from his pants moments before the shooting at their home, and watched as a bleeding Weaver fell to the kitchen floor.